Prince Goes To 'austere' School Prince Charles of England is attending a school in Scotland that is noted for its spartan life. GV of school, beautiful scenic shot. Prince Charles walks with Prince Philip outside school. They proceed to shake hands with gentlemen. CU Prince Charles, pan up to Prince Philip. Dormitory, one level building. Prince Charles, Prince Philip and other boys standing outside of Dormitory, then enter. CU shot of crowds waving at the newest member of the royal family. MS of the Prince Philip and Queen Elizabeth II walking out with Queen Elizabeth II holding one month old Princess Anne. Tight MS of the Queen holding the baby and shaking a few hands. MS of Prince Charles about to turn two. An exciting adventure begins for England's Prince Charles and Princess Ann escorted by the Queen Mother and Princess Margaret they journey to Ports Smith. At the dock awaits the royal yacht Britannia awaits in readiness for the party. Its the first time the young Prince and Princess embarked on a real ship they'll voyage to North Africa to meet their parents on the last leg of their commonwealth tour. Time for farewell and Bon Voyage from the Queen Mother and their aunt Princess Margaret. Establishing shot - A young Prince Charles and Princess Ann escorted by the Queen Mum on their way to the Royal yacht, Britannia. CUS - Prince Charles looks at the camera giving a hint of a smile. MLS - The Royal Yacht Britannia. CUS - Queen Mum, Princess Margaret bidding Bo Voyage to Prince Charles and Princess Ann as they embark the plank of the Britannia. MCUS - The Britannia's royal navy standing at attention as the young royals embark on the Britannia. MCUIS - The royal children on the deck of the Britannia escorted by Queen Mum and Princess Margaret. MCUS - Queen Mum, Princess Margaret waving farewell to the children as the Britannia pulls away from he dock. In London, it's parents' day at Prince Charles' school, and Queen Elizabeth and Prince Philip proudly watch their normal, ordinary eight year old playing with his chums. Establishing shot - Little Princess Ann shaking hands with a loyal subject and her father Prince Philip is exiting the car. MCUS - Little Prince Charles with his arms held in back of his back greets his mother with just eye contact. He introduces his mother to his friends and their families at school, the Queen graciously shakes the hands of Prince Charles friends. MCUS - Little boys standing in a line are approached by Prince Phillip and he smiles at them shaking their hands. MCUS - Prince Charles and school mate make it across a hanging bar with their hands leaving the rest of their bodies hanging. MS - The Royal family sitting together watching little Prince Charles partake in sports, this time its a relay race between the boys and Prince Charles. 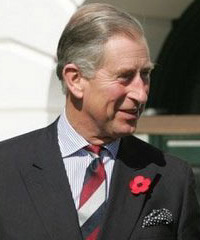 Britain's exclusive Cheam school receives a 'new boy,' Prince Charles, the first Prince of the blood to attend a public school. Establishing shot - ML - Cheam school the new school that Prince Charles will attend. MCUS - Queen Elizabeth, Prince Phillip and little Prince Charles who is 9-years old. CUS - Prince Charles trunk which has an engraved brass plate on it (H.R.H. Prince Charles).MCUS - Prince Charles walking up the steps to the school. At the top there's a small group of boy ready to greet the new student. CUS - A smiling little Prince Charles. News in Brief: England, Birthday For A Prince. News in Brief: England, Birthday For A Prince. Prince Charles is four years old and all England joins his mother Queen Elizabeth II in celebrating. His little sister helps out too. The little prince looks out from window of Buckingham Palace (unfortunately a dim shot). Brief scene from changing of the guard. Two still photos of Prince Charles sitting in a toy car, one with his mother smiling at him. Cute still photos of the two little kids, Princess Anne and Prince Charles, posing together. Prince Charlie's First Visit Bonnie Prince Charles, Princess Anne with the royal family, makes his first visit to his principality since becoming prince of Wales. exhibition, arts, crafts, nationality. Board Britannia. Royal family waves to welsh crowd. Audio is low on screener Informal pictures of Britain s Royal Family on vacation, at Balmoral castle. Queen Elizabeth and Duke Philip relax with young Prince Charles and Princess Anne and the family pets. Unusual close-ups of a distinguished family at play. Establishing shot - Queen Elizabeth her two children, Prince Charles and Princess Anne and Prince Philip. MCUS - Prince Philip petting a dog, (Golden Retriever) and Prince Charles playing with the dog's tail. MCUS - Queen Elizabeth standing with her hands on her hips smiling. MCUS - Prince Philip pushing Prince Charles on a swing. MCUS - Princess Anne, Prince Charles and Prince Philip working with the horses. CUS - The Royal Family sitting on a bench. NO AUDIO The highlights of the British Commonwealth games at Kingston, Jamaica, featuring first films of HRH Prince Charles, Prince of Wales, playing polo. Kingston, Jamaica Wide angle shot of the polo field in Kingston, Jamaica. Camera zooms in to Prince Charles taking a sip of a drink while standing with a friend and an older gentleman. MS as a Polo player mounts his horse and a crowd of people stand around the players. Prince Charles mounted on his steed sporting the No. #1 on the back of his shirt. Wide Angle Shot of a polo game in progress with fans watching in foreground. Prince Charles takes a swing at the ball and hits it. They race towards the goal. Polo fans watch from the sidelines. Some with binoculars and very serious facial expressions. A solo shot of Prince Charles hitting the ball while riding his horse. His teammates eventually catch up to him. Close High Angle Shot of a young (teenage?) Prince Charles wiping the sweat from his face with his arm. Wide Angle Shot of Prince Charles and his team mates playing in their Polo match. "England's future King becomes a freshman at Trinity College of Cambridge University. The 19-year old Prince will major in archeology and anthropology." MS/CUs young PRINCE CHARLES exiting car, surrounded by police, press photographers and onlookers; Lord Butler of Trinity College meets the new freshman. MSs Prince Charles walking through a library, stopping to open book. MS/MCUs handsome Charles standing dressed in a collegiate robe in courtyard.